Abstract. Observations and climate model simulations consistently show a higher climate sensitivity of land surfaces compared to ocean surfaces. Here we show that this difference in temperature sensitivity can be explained by the different means by which the diurnal variation in solar radiation is buffered. While ocean surfaces buffer the diurnal variations by heat storage changes below the surface, land surfaces buffer it mostly by heat storage changes above the surface in the lower atmosphere that are reflected in the diurnal growth of a convective boundary layer. 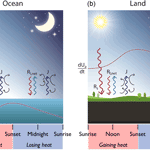 Storage changes below the surface allow the ocean surface–atmosphere system to maintain turbulent fluxes over day and night, while the land surface–atmosphere system maintains turbulent fluxes only during the daytime hours, when the surface is heated by absorption of solar radiation. This shorter duration of turbulent fluxes on land results in a greater sensitivity of the land surface–atmosphere system to changes in the greenhouse forcing because nighttime temperatures are shaped by radiative exchange only, which are more sensitive to changes in greenhouse forcing. We use a simple, analytic energy balance model of the surface–atmosphere system in which turbulent fluxes are constrained by the maximum power limit to estimate the effects of these different means to buffer the diurnal cycle on the resulting temperature sensitivities. The model predicts that land surfaces have a 50% greater climate sensitivity than ocean surfaces, and that the nighttime temperatures on land increase about twice as much as daytime temperatures because of the absence of turbulent fluxes at night. Both predictions compare very well with observations and CMIP5 climate model simulations. Hence, the greater climate sensitivity of land surfaces can be explained by its buffering of diurnal variations in solar radiation in the lower atmosphere. 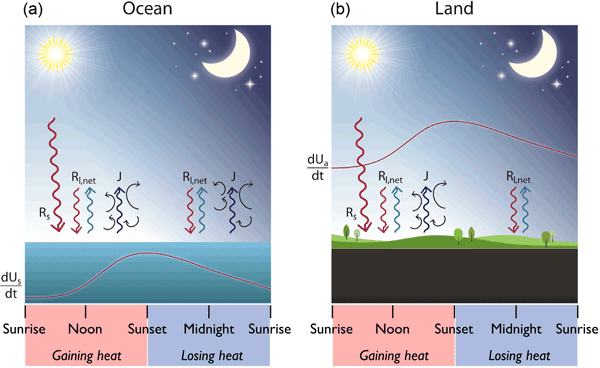 How to cite: Kleidon, A. and Renner, M.: An explanation for the different climate sensitivities of land and ocean surfaces based on the diurnal cycle, Earth Syst. Dynam., 8, 849-864, https://doi.org/10.5194/esd-8-849-2017, 2017.